Recall that today's Daily Dose of Delight is from Take Me Out to the Ball Game. As you reflect upon the clip selected by Gary Rydstrom, recall his discussion of Blanche Sewell. Please respond to the questions posted. Thinking like a director and editor, describe how each shot spotlights key actions. It’s interesting to examine how musicals segue into musical numbers. How does this sequence prepare us for the singing? 1) She is trying to attract him through each scene. He will react to what she is saying such as tossing the ball or backing up and in the end sliding down the banister for her to catch him. 2) It prepares us because he is coming out of the room and she is leaning against the wall you know she will start singing at that point. Hmmm...this is the kind of musical sequence I do not care for. In my view, Garrett is not an appealing performer. She is the focus of this song and dance, and I find her voice grating, and her appearance unattractive. Perhaps that works for her here and in her duet with Sinatra in "On the Town" ("Come Up to My Place"). In both songs, Garrett is the aggressor, and Sinatra just can't see her for dust. She is so mismatched with him physically that she can sling him over her shoulders! It should be noted that Garrett was married to the uber talented Larry Parks who played Al Jolson brilliantly in two biopics about him. It will be too bad if "The Jolson Story" is ignored in this course. If it is, everyone should just watch it. Parks is a better Jolson than Jolson ever thought of being. At any rate, it was Parks' communism that got poor Betty Garrett in trouble, not her own political activities. She was loyal to him until his death. 1.Thinking like a director and editor, describe how each shot spotlights key actions. After Sinatra enters the scene from the "Players Locker Room," (Sinatra is not much of a "player " here) Garrett is lying in wait for him, and corners him at the turn of the corridor. The hall is narrow, enhancing Sinatra's sense of being hunted. When he turns to run from her, Sinatra enters the bleachers which act like a sort of maze for Sinatra to negotiate in order to flee Garrett's unwanted attentions. This maze-like setting heightens the tension for the audience. The baseball theme is noted in the playful use of the ball, as Garrett encourages Sinatra to "play ball" with her. The stands at the ball field provide lots of places in which Garrett can trap Sinatra and try to convince him that he is attracted to her. The set could have used the ads at the top of the bleachers to feature products that would have highlighted the "fate" or being "trapped" themes of the song. The failure to do so was surprisingly sloppy for an MGM musical. This is a lesser effort from the leading studio of movie musicals. 2.It’s interesting to examine how musicals segue into musical numbers. How does this sequence prepare us for the singing? As Sinatra leaves the locker room his gait is jaunty, and he is also bouncing a baseball back and forth in his hands as he enters the scene. He actions are done in time to some upbeat background music. The music turns menacing as we see Garrett bow her head, and simultaneously look up at Sinatra through hooded eyelids at the end of the short hallway. It is definitely a predatory gaze. By the time she yells "hey" after the chase music into the bleachers ends, the mood is set for Garrett's sexually aggressive solo. Dancing up the bleachers, with Betty chasing Frank, it really was interesting to watch how the camera followed them. The way Betty trapped Frank at the wall was interesting, too. He was so small, and she was almost overpowering. The chasing up the stairs was also cute. Background music often plays the major musical theme of the song. We don't get the intro, but the theme, which can occur halfway into the first section of a musical number. It may be in a different key, use different instruments, or even whistles and train sounds, as long as the notes are in the same order and tempo. Sometimes a tap dance will give the rhythm of a song along with other cues. I haven't seen light as the cues except in Mr Holland's Opus. 1. Thinking like a director and editor, describe how each shot spotlights key actions. The direction of each shot plays well into the setting of a ballpark (also a key to the national support for the audiences as an American pastime - also given that Garrett’s character is the most dominant figure within the scene juxtaposed with a male dominated sport like baseball), but sets up the perfect dynamic between Garrett and Sinatra. Beginning in the hallway, Sinatra emerges confidently, tossing the baseball in his hand before entering the space of the hallway - just like with decisions - leaves no room for lingering or feelings of being uncertainty. Sinatra must decide to go either forward or backward - or is more so forced to go forward or backward. He decides to go backwards which takes the action into the stands. The bleachers present a vast space for character blocking and metaphorically for the possibilities of Garrett’s feelings for Sinatra once she finally has him. They can use the structure scape of the stands to accent the musical number as seen with his back hitting the wall, when she’s chasing him up the bleachers (metaphorically as in a relationship she’ll follow him wherever he goes, even up to great heights, as long as she can call him hers). And then of course as the action within the scene matches the musical cues of the song, it ends on the descending feeling of defeat as Sinatra descends the hand rail while Garrett emerges the victor in a ballpark, a universally recognized arena of sport. What better sport than the game of love? 2. It’s interesting to examine how musicals segue into musical numbers. How does this sequence prepare us for the singing? This sequence prepares us for the singing with the actors blocking their actions on the musical notes and cues. This takes place from the very beginning of the clip once Garrett blocks the hallway from Sinatra. From that point, as they become choreographed, and as she begins to prowl and then chase him into backstepping, their movements escalate steadily and perfectly to the rising tempo of the musical number, perfectly synced while reaching an apex of movements and music that results in attention-getting silence as she her first verse. This is and has always been one of my favorite films. I find this song and the actions playful. Betty's character is the aggressor obviously. Frank's actions are at first playful trying to distract her from her mission, but she continues to corner him cutting off his escape as the words of the song imply leaving him no choice but to listen to what she has to say and notice her. Thus accomplishing what she intended all along, getting his attention. I've always admired Betty's agility. Running up the bleachers like that isn't easy. I know I personally would not be able to do it in shorts and bare feet, let alone in a long dress like that and heels. They prepare for the song by having Garrett's character laying wait for Sinatra, then dropping the music in over the action of her beginning to try to get his attention, then the chase begins as he attempts to avoid her. The chase continues as the music turns into the song. The choreography then reflects the words of the song. 1. The shot by shot of this sequence is so well done that the sequence was edited to allow the audience to know thw exact action that follows. The step by step up the stadium seats lets you know that she is literally chasing him and not going to be ignored by him. If you watch very carefully the producer made a point to have the film edited in such a way that the audience could see each step before and after as leading up to the woman getting the man's attention and never losing it. 2. The sequence prepares us for the musical number by having the actors keep in step with the beat and lyrics of the sequence. You know from the start that it is leading up to a musical number before she begins a note. This is based on her facial expression before she even sings a note. It also has the gag reel type acting of the era before it. The opening shot where Garrett's character ambushes Sinatra's feels somewhat claustrophobic. The narrow hall, high walls, tight corners, lighting and window without a view adds to this feeling. Sinatra's character's step is jaunty and upbeat as he tosses a ball in the air until this confrontation but his happy deameanor soon changes as he flees first backstepping then running up the stairs and across the stands from Garrett's pursuit of him. His steps are choppy and he tries to keep a clear distance between the two as the camera shows in a long shot of Sinatra scurrying the stands then a medium long shot when each actor stops and confronts the other face to face. The ball toss is Sinatra trying to downplay Garrett's aggressiveness but Garrett discards the ball quickly indicating she has no intention of dialing back her pursuit. She wants to, "play ball" but not in the sense Sinatra intends. This is no silly ballgame, she is on the hunt, for Sinatra. The remainder of the scene has Garrett backing Sinatra against walls, hovering over him, pulling him aggressively down from the uppermost stands and picking him up and twirling him about on her shoulders. The last shot has Sinatra still trying to evade her and extreme behaviors. He, well his double, slides down the handrail backwards but there's Garrett at the bottom to catch him. The entire routine is a flip, a role reversal of the typical scenes of boy aggressively pursuing girl so typical in the films of the era. Think of Gene Kelly's pursuit of Judy Garland on the day of her wedding in, The Pirate. I find it ironic that Sinatra is portrayed this way in his early films as if he is naive and inexperienced with woman. Nothing could have been further from the truth so the decision to portray him this way is comical in itself. The song lyrics match perfectly the actions. In a similar scene between these same two actors in, On the Town it is the prior actions in and out and around the cab that segue into the singing in the cab (Come Up to My Place). But in this film and scene the lyrics and actions are continuous to one another and segue immediately. This number is all about Shirley dominating Dennis, and as such each shot is framed in a way which prepares the audience for what she is saying and/or doing in order to get her point across. Most noticeably, Shirley always appears to be more centre-frame than Dennis is. Every action of hers is highlighted not only by musical cues, but also because she is right smack dab in front of us. The "ambush" happens in a narrower hallway before the action moves us out into the open ballpark. We first get quite a limited field of vision, and Shirley sneaks up on the audience as quickly as she does Dennis. When the music swells and the camera follows the characters into the park, we get a huge sweeping shot of the empty bleachers. Seemingly so much room to make a getaway, but along with Dennis we find ourselves with nowhere to really go as the camera cuts to close-range once again. Similarly, at the end of the sequence, Dennis is "defeated" and the orchestration matches perfectly with his literal sliding into Shirley's arms. It's also interesting to note that the shots are mostly close-up to the actors. Again, creating this sense of having nowhere to turn and the "too close for comfort" type of feeling. We've got to stick out what Shirley has to say. The matching of sound effects and orchestration to key choreographic actions (knocks, steps, slides, placement, etc) creates perfect punchlines. The song is not subtle, and therefore the action cannot be either. Shirley is physical, and everything she does is punctuated by her framing and the music. The orchestral backdrop of this scene really helps to seamlessly connect the initial action with the singing. Shirley chasing Dennis up the stairs into the park matches the swelling of the orchestra, with Dennis appearing to almost be able to make a getaway as the music reaches its highest and most frenzied point until we are met with Shirley's cutting "HEY!" - at which point everything stops. A wonderful use of orchestration and editing to create a mood of anticipation and eagerness to know what is going to happen leading up to the singing. Shirley is just an all out stalker. She waits for him and there is where the cat and mouse game begins. The scene is continuous, the camera follows up and onto the bleachers in stadium where Shirley is aggressive. The tables are turned and the woman is chasing the man. The camera follows at a distance up the bleachers. You see how spaced out the bleachers are as the characters go up (Dennis is running for his life). With the cameras further back the performance shows how the entire space was utilized, from the very top to the bottom. The close up of Shirley hoisting Dennis over her shoulders is hilarious. As soon as Dennis walks out and Shirley jumps out in front of him, you know there is a song coming on. The look on Shirley's face tells it all. She has something to say and he was going to listen. Each shot spotlights key actions by placing the camera in the right place to capture some physical cue/gag that goes along with the action of the story (i.e. Sinatra tossing the ball for a game of catch after Garrett sings for him to “play ball with [her]”) and by keeping the focus on Garrett as the dominant force in the scene. Having the camera retreat with Sinatra as he tries to evade her advances (often framing him in profile or from behind), while keeping Garrett’s face in view throughout much of the scene increases her aggressiveness and the tone of the sequence. 2. It’s interesting﻿ to examine how musicals segue into musical numbers. How does this sequence prepare us for the ﻿singing? The sequence sets up for the upcoming song by carefully choreographing the blocking during the scene in the locker room. The score, which begins in the locker room, sets the mood for the upcoming song, and the actors’ blocking matches the rhythms of the score. There seems to be two types of shots. One shot relies on a medium closeup of the actors while singing, focusing on their facial expressions while singing. The other type of shot is a wide shot that focusing on the full body, displaying the choreography of the scene. If I remember correctly, I think I read where Fred Astaire wanted a wide shot of his dance scenes that displayed the movement of his body movement with minimal cutaways to closeups. On a side note, I suspect a stunt double replaced Sinatra at the closing shot of his character sliding down the rail. Shot from the back with his hat obscuring the stunt man's face. In this scene, the actor's movement is edited to the opening music of the song. Today's reflection questions seemed to me to be 1 item that can't be separated so I've rolled my reply into one reflection. If the musical numbers are intended to further the story then there has to be a setup for them. Characters need to lead us into the purpose of the number. Sometimes the song is to profess the obvious like the love that two people recognize. In other numbers it's done with comedic relief that seeks to lift the veil between two people as in the "Fate" number in "Take Me Out to the Ball Game." The camera has to lead us into the number because musicals feature an interplay between dialogue, singing and dancing. We need some long establishing shots that show off the dancing while moving the story along even if there is a minimal amount of singing. There camera and dance numbers can convey to attraction, the chase, the push away and the eventual giving in without saying a word. The words of song will mirror those actions. Over the course of the number the shots change to medium and eventually closeup so that the song's connections between the characters in the numbers can be established. Pacing for a song can be reflecting in the editing if things are to evolve quickly between two characters. Sequences with up temp numbers tend to make these connections pretty quickly and fast paced editing with multiple shots makes the number itself move even more quickly for the viewer and consequently moves the story along be resolving something, establishing something etc. The director, editor, musical team, actors need to be on the same page if the number is going to work. In cases where numbers are introduced that don't move the story along (i.e., variety musicals) then the coordination feels very different. In order to build upon Betty Garrett chasing after Frank Sinatra, the scene needs plenty of room. It starts in tight quarters, in the area outside the clubhouse, out to the field and then into the stands. The music is building as she is waiting outside the clubhouse door and he starts to run. The song is coming soon. You know that she being in that area, where women wouldn’t my have been in that era, she is going to be the aggressor in the scene and have the lead in the song to move the story. Tried to watch this movie and fell asleep in the middle. Just not my cuppa. And I like baseball. Maybe it was Esther Williams, who is about as appealing as a bowl of oatmeal. Both questions allow this number to shine in terms of editing and directions: Frank Sinatra was a minimal dancer at best. Here, he is likely at his lowest skill level, so we see have Garrett and Sinatra doing dance moves with upper torso, but below, it's no dance. Instead, this is a mating dance. The musical number's theme is telegraphed with the words on the walls (our "players" in this number are indicated by Frank strolling out of the "players locker room" only to run into the opposing player, Betty Garrett) , arrows, and body language by Betty directing us toward the bleachers and a predator vs. prey scene that is reversing traditional gender roles. Their initial interaction has her blocking his escape -- literally showing the point of the scene as not escaping "fate." Direction and editing allow "the hunt' to take place on the bleachers where we, as spectators, watch Betty's character, "hunt" Frank's. We aren't discussing choreography, but the direction and editing allow for as much movement to accompany this song as possible without revealing Frank's limited dance abilities. She sings "play ball with me," but when tosses the ball to her, she tosses it aside as that's not the kind of ball about which she sings. The reverse gender pursuit in this scene would have been something women of the time might have related to with so many men overseas. Additionally, the women going into the workplace to keep industry going, as is well documented, upended gender roles that women were reluctant to return to post-war. She backs him up against the wall, and she is the one who puts her arm over him -- both traditionally male actions. The signs in the bleachers behind the duo put Frank, at one point, almost at a bullseye as one lines him up for her to aim and hit her mark. Then, to signal the number is winding down, Frank (his double) slides down out of the set -- only to have Betty Garrett shimmy down and catch him at the song's conclusion. Literally it's over. It's fate. It's a light number deftly shot with an amazing singer (Sinatra) and an amazing work horse (Garret) being shown to their best strengths while the tune moves the plot along. I might also note the rather subdued colors used in this number don't pop like the colors for Kelly and Williams. Interesting choices in tones for this number -- almost washed out to match the nostalgia for Americana of yore. Additionally, I love the pairing of Sinatra with Garrett and really do find it a tragedy that Garret wasn't allowed to do more with Frank or anyone as the pairing was genius. The segue question is interesting. It's actually what makes some not like musicals at all. As someone I know says in relation to West Side Story, these two gangs are about to fight so why are they suddenly singing and dancing? It is funny in a way, but it's exactly the point of musicals, to tell a story and further it when necessary with the songs. This particular scene starts with Betty chasing down Frank, who's trying to escape, and when she yells "HEY!" to him, he stops. At that same moment, the orchestra blares and we're kicking off the song. Perfectly fit, natural feel. I also like how we see Frank has run a bit of distance when she yells for him to stop, and we see both figures still on the screen with the wide distance between them. The musical referred to in the lecture video today (Bathing Beauty) doesn't have that natural segue. 1929's The Broadway Melody neither. I don't believe I'd heard the term "variety musical" until today. Betty Garrett probably was given the most self-assured female characters in musicals of this era than anyone else got. We see it in the Take Me Out to the Ball Game clip. We also see it in On the Town and Neptune's Daughter. Interestingly and probably just coincidentally, all three of these are 1949 films. Garrett unabashedly wants Sinatra in today's Daily Dose clip and she has no shame (nor should she) in pursuing him. In On the Town, it's the same situation with the same actors, just as different characters and in a taxi cab. 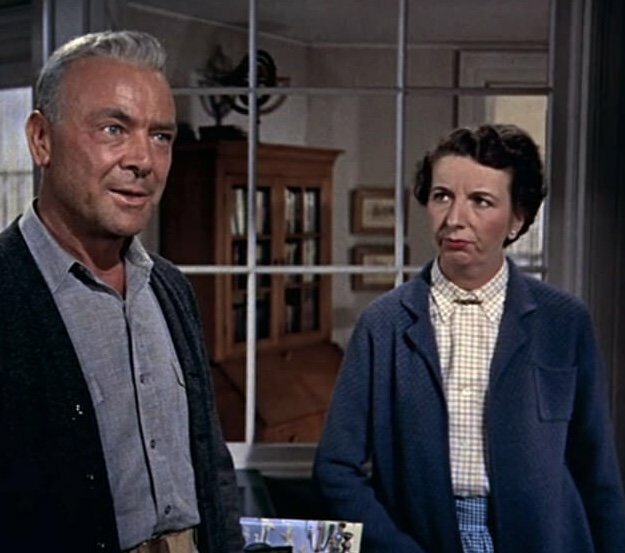 In Neptune's Daughter, she's turning the tables on the traditional "roles" within the song "Baby, It's Cold Outside" (which won the Best Original Song Oscar that year, by the way) by being the aggressor to Red Skelton's character. I love that Garrett always got these roles and was allowed to turn the tables on the norms of the time's societal behavior. If I may be so bold, I've attached both of these examples below so you can see for yourself why I think Garrett was one-of-a-kind. Have to agree. The girl could swim and dazzled in the looks department, but she is about as compelling as milk toast. How is one dull with Gene Kelly? How? It must have been a period thing that she was so uniquely athletic and in a bathing suit to maker her a hot tomato in the public's eye. I’m definitely seeing a switch here with the Man Sinatra being the innocent while the Women Garrett intensely Persues the man, the wolf shall we say; all in great comedic fun. All the dance moments seem simple enough and play right through with ease. The movements are quick but are quite tightly choreographed and one shot follows another in perfect sequence. Enthusiasum bounds from Garrett which makes the whole number work the singing just seems to follow along with the routine. It’s all done to perfection. 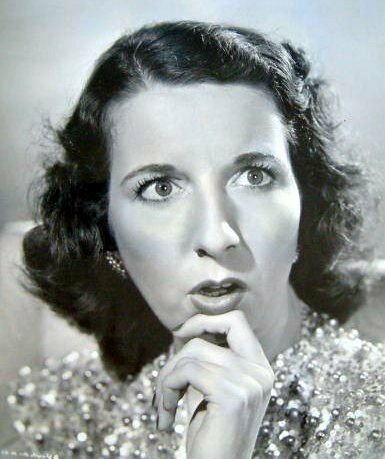 To bad about the blacklisting of Betty Garrett as her style reminded me of character actress Mary Wicks (see two images) and I think we missed out on some great moments. It's obvious in the clip that Betty Garrett is after Frank Sinatra, her character is chasing him and cornering him against the wall. She is the dominant one of the two and does not mind a challenge in getting the one she wants. As much as I love musicals, I will admit that with some musicals I don't like the segue into numbers (and this Daily Dose is one of them) ? Let's start with the whole feeling of Frank Sinatra being 'trapped' by Betty Garrett. It is obvious that she has got something to say and by damn, she is going to say it come hell or high water. I found it interesting that Betty Garrett was blackballed, another actor to fall to the 'witch hunts' of McCarthyism. Most musical segues are awkward. Yet I don't find this particularly so. It has a substantial and lengthy set up before the first lyric is sung. There've been times when two characters are in a clinch prior to a kiss and suddenly one of them bursts into song inches from the other's face. I half expect the other person to back away, bug out their eyes and exclaim: "What the heck are you doing?" But, then, I remind myself: "Hey, it's a musical. That's what they do." Inasmuch as I liked Garrett in later years, I never cared for that loud, pushy, 'you're-gonna-do-what-I-tell-you-to-do' character, i.e. Betty Hutton, Cass Daily, Nancy Walker, etc. who usually always seemed to hone in on the weakest male character in the plot. One aside note, I was never a fan of Jules Munchin. He kind of reminded me of Milton Berle. Both creeped me out. Even as a kid watching Uncle Miltie on TV, I remember being more disturbed by him than amused. 1-This number is a perfect example of choreography...not just in actor movement, but in camera, editing, and direction as well. Every part of this number is a dance (despite the fact that there is no dance!) the set is used as a character, every hall, step, bleacher and nook and cranny is used in a calculated and planned manner. Sinatra is "cornered" at all times between Garrret and the set itself, the cat has not only tracked the mouse, but knows exactly where to lead him to trap him. The song is supported by the actors, the direction, the choreo and the editing, all are in cahoots with Garrett to trap her man. This number is an excellent example of all of the parts of th machine working together in calculated planned harmony. The build up to the musical is done through a feeling of tension between Garrett and Sinatra as she invades his personal space until he runs away. Pretty comical. I am wondering how Sinatra liked being picked up and whirled around at the end?. Also wondering how Garrett ran up the bleachers in that dress! Liked the fact that the frame was large enough to see the full view of the bleachers as they are running up them. Thinking like a director and editor, describe how each shot spotlights key actions. Each shot is focuses on allowing Betty Garrett's character to have the upper hand. Basically, Sinatra's character doesn't stand a chance. It’s interesting to examine how musicals segue into musical numbers. How does this sequence prepare us for the singing?﻿ This sequence is the perfect example of "there's a song a-coming" From the moment the door opens, and Sinatra tries to avoid Garrett, to the characters climbing the stairs, you know what is coming.